H264 has it all. Buy-in from the big content providers, compression ratio superiority, mobile device support, and support in all major video editing tools and operating systems. Many people seem to criticize Mozilla for being idealistic and not providing its users what “they want”. Chris Blizzard wrote a great summary of why Mozilla isn’t endorsing h264 and herding its users into the patent holder’s stall with historic examples of GIF and mp3. Big players might have their reasons to go with h264, but individual small publishers (aka blog posters, you & me) can already publish in this safer format (Currently both Firefox 3.5+ and Chrome 4 support Ogg Theora playback and Opera will). An observant reader might realize there’s quite a hole in this free argument as most of the content you’ll shoot, you’ll probably shoot on an AVCHD camera and thus will need an h264 decoder to eventually get to the free format. But who knows, maybe we’ll see some cheap Theora cams once the MPEG LA starts collecting form hardware vendors. Instead of drowning in this catch-22 I’ll give you a few practical tips on how to produce Ogg Theora video. I would be thankful if a good soul would use the comment area here to provide a gstreamer pipeline to encode a file into ogg theora (extra hugs for a series of still images and audio muxing). Update! Apart from getting that pipeline, I was pointed to what appears to be a nice no-nonsense OggTheora converter (does Schroedinger and vorbis as well) - OggConvert. Thanks! On the Mac, I haven’t had much luck with the official Xiph quicktime components in the past. What worked for me was the Perian bundle. 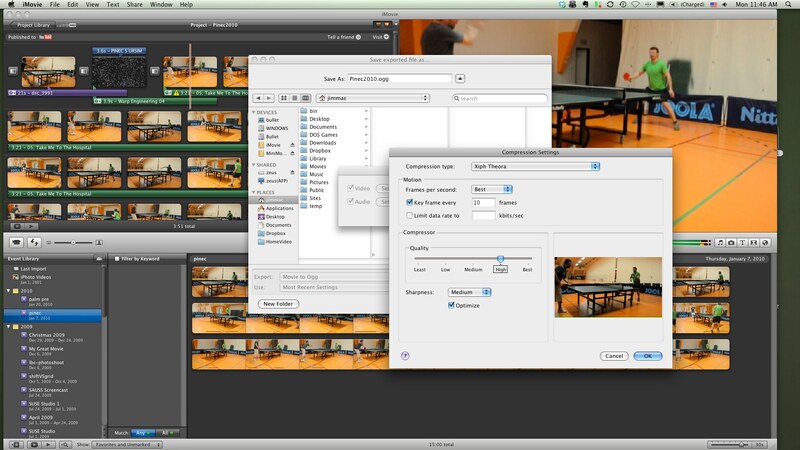 After installing the components to /Library/Quicktime/Components/ apps like iMovie are able to export to Ogg Theora. How about MS Windows? Xiph provides direct show plugins for Theora. This should provide a system wide decoding and encoding. I can’t give any recommendations on converters, but I bet you can use Handbrake, which is also sweet on Linux & OS X. So should you rip you DVD collection into Theora? Probably inefficient and impractical. Should you publish your videos in ogg theora as a primary format? Most definitely! So how to do that? Notice we already have the HTML5 supporting browsers covered. Now all the rest we cover with a Flash fallback. My suggestion is to use Flowplayer. I believe you can use the h264 mp4 stream directly with it, but if you want to support older flash plugins, you need to re-encode your clip to FLV (yay!). You can use ffmpeg and flvtool (to fix the metadata and index and allow flawless seeking). <embed width="640" height="480" type="application/x-shockwave-flash" src="/flowplayer.swf"
I hope this is a useful introduction on how to put your videos on the web. Feel free to correct me in the comments or give some more tips for everyone! Update - Added OggConvert to the encoding section.